For 35 hours a week, Champlain Valley Union High School's halls are filled with hundreds of busy students, most of which don’t notice the eco-destructive parts of the school. They also don’t recognize the environmentally friendly aspects of the school that were established as unusual. However one group does: EnACT. 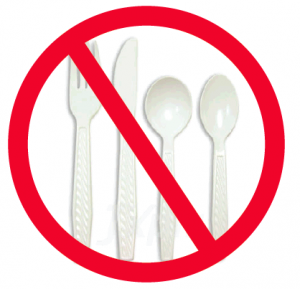 Until 2015, using plastic silverware at CVU was normal for students and they didn’t think much of it. A group of young environmentalists recognized the detrimental effects of our excessive plastic waste and decided to make a change. When this concern became evident to people, it was brought to CVU adults. With the need for change established, Leo LaForce, CVU’s Food Service Director, switched the cafeteria’s utensils from plastic to silverware. This immensely cut down on plastic being used at CVU by reducing the 2,000 plastic utensils previously being used each week. In an attempt to reduce it even more, silverware was collected and distributed to advisories (similar to a homeroom, where you meet daily with a group and teacher) to be used for eating in those times. This is not the first time CVU’s Environmental Action Club has led an action to help our environment. Starting in 2011, they began working to lower CVU’s energy intake by working with Whole School Energy Challenge, Efficiency Vermont and Vermont Energy Education Program. In addition, EnACT worked to establish systems that saved energy used by desktop computers. They ensured no energy was being wasted during breaks as well by encouraging faculty and students to unplug school electronics before leaving for break and had “unplugging parties”. As a current junior at CVU, using metal silverware is normal and I never think twice about it. The idea of reusing silverware that other students have used may not be the most appealing idea to high school students, but our amazing kitchen staff appears to be meticulous in their cleaning because the silverware is always spotless and sparkling. Convenient soap tubs for the silverware are located right at the waste stations to ensure their easy and proper return. The flexibility of having portable plastic silverware for people who need it assures that everyone is happy.